as a first EU leading initiative towards the establishment of DRM conformance (DRM-C) practices. The project will provide a means for the development of EU based conformance testing IP in support of future development of interoperable DRM tools, components and solutions thus furthering the state of the art in digital content creation and distribution. DRM and interoperability are definitely within scope but conformance testing is less of a priority of the Strategic Objective. This answer defies my intellect. How can one say that interoperability is important and conformance testing is not? Maybe the reviewers didn’t know what a standard is (no problem), but if you are revieweing a project on interoperability of something you cannot say that the means to assess whether there is interoperability are not important. It would be like saying that laws are important but tribunals are not. Unless, I mean, interoperability is one of the nice words which everybody pays lip service to – and then keep on erecting walls. I had a better chance with two project proposals that I submitted in later years. The first was CONVERGENCE, a project submitted by a consortium of 12 European partners and the second GreenICN, submitted by two separate 6-partner consortia – one from Europe and one from Japan – with a common work plan. Even though the two projects are independent, and sequential in time, they are tightly connected for the latterto be considered as the continuation of the former as far as CEDEO is concerned. Internet has been quite successful in responding to the expanding needs of its users. However, the internet has shortcomings, e.g. the unpredictable bitrates available over long distances. Peer-to-Peer (P2P) Networks and Content Distribution Networks (CDN) are overlay networks that use content replication strategies to lower the probability to findnetwork bottlenecks. The interesting point is that they move away from a host-based to a content-based communication model. Information Centric Networking (ICN) is an emerging communication paradigm in which each information unit is stored as an individually identified entity at an appropriate granularity level, so that it is possible to retrieve it by simply using its identifier. This is alternative to retrieving an information unit from a logical location whose physical address is provided by the Domain Name System (DNS). Therefore ICN can be seen as an incorporation of P2P and CDN functionalities into the network layer. CONVERGENCE is an ICT system consisting of a set of interconnected peers and nodes collectively called “CONVERGENCE devices”. 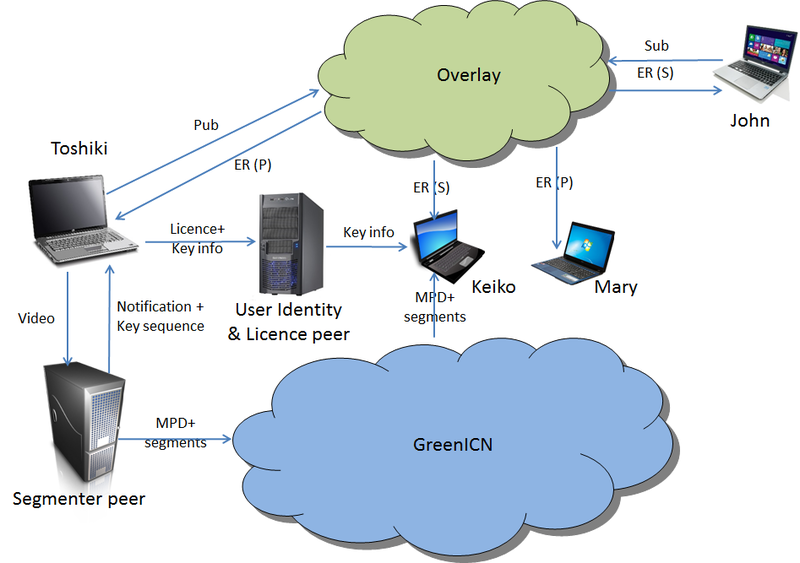 GreenICN uses and expands the same architecture with different names. Peers, the means through which users access network functionalities, are essential components for an ICN. 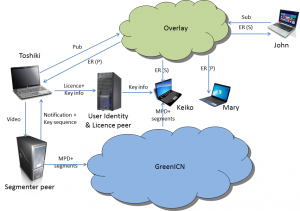 The GreenICN peer architecture is based on MPEG-M and uses a number of other MPEG standard technologies. A complete architecture of a Peer is depicted in Fig. 2. 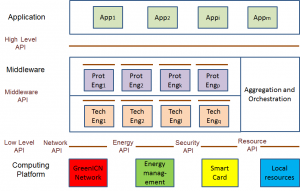 Each of the 3 layers has its own structure and communicates with other layers via standard APIs. The GreeICN Peer exposes the High Level API defined in the Table below. 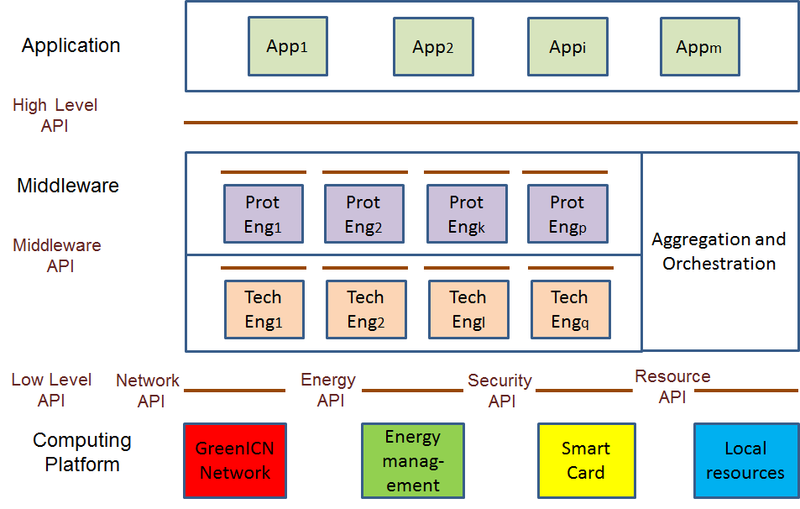 Currently the GreenICN Peer supports the Protocol and Technology Engines defined in the Table below. The GreeICN Peer exposes the Low Level API defined in the Table below. John and Keiko, Toshiki’s customers. Figure 4 depicts how Publish/Subscribe works in CONVERGENCE.